Mt Bogong is Victoria’s highest peak and has long been a site of significance. The village is situated on the side of a valley and has a sense of the uncanny about it, produced by the unusual mix of natural and artificial elements. The village was built in the 1930s to support the installation of a hydro-electric system while Lake Guy, at the foot of the village, is part of a concealed network of pipes, tunnels, catchments and generators that handle water flows around the system. The buildings of the village were constructed at the same time, and are now largely empty outside of tourist usage: perhaps this produces something of the ‘ghost town’ feel. Site-specific audio has recently been featured at the Rolling Stock event in Junee, NSW (RT101) and has also attracted a high public profile with Suzanne Philipsz’s Lost Reflection winning the UK’s Turner Prize. 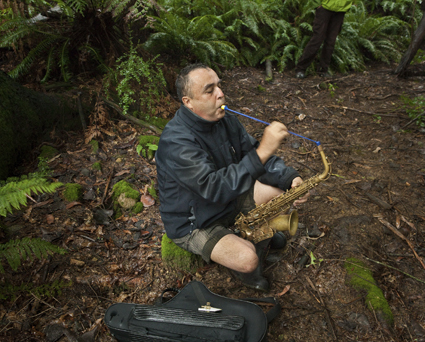 The outdoor performances of Bogong AIR set sound within nature, the tension of this combination heightened by the intense weather conditions, as indicated by Denley’s performance. On the day, the artist invited the audience to his solo piece with a caution that it entailed a 20-minute walk through rain and wind on a slippery path; after a moment’s pause, almost everyone set out to follow him. Indeed, getting wet did not prove fatal and the effort involved gave the experience a stronger character. In her artist’s talk, recorder player Natasha Anderson remarked on the linking of music and a forest setting—apparently the recorder was a key instrument of the Hitler Youth and playing it in forests part of an ideological idealisation of nature. Anderson’s solo performance at the dam wall seemed unusually disjointed and awkward, but became more interesting in the context of these cultural references. Denley and Anderson, Hall and Hui-Sheng performed in pairs inside the vaults of the dam wall creating a satisfying and delicate work that explored the acoustics of the space. In a nearby forest clearing, Denley, Hui-Shang and Hall’s trio performance was curiously enhanced by the drizzle—the strong presence of the elements perhaps evoking something pagan. Architect Dianne Peacock created a video work based on the dam wall architecture, re-projecting it within the space. Interestingly, the creative process of filming functioned as a starting point for Peacock’s imagination, as she re-imagined the monumental dam structure as a concrete skyscraper to be played upon. Eric Le Casa’s composition for canoe, was a gorgeous festival highlight, placing two listeners at a time with iPods in the floating boat. The electro-acoustic composition comprised natural and artificial sounds related to water, responding to the unusual mix of those elements at the site. La Casa’s half-hour composition, if perhaps overly exhaustive in exploring its theme, ranged dynamically across passages of powerful materiality and delicacy, surprising shifts of perspective and intensity. Visiting from Ireland to present work at the 10 Days on the Island Festival in Tasmania was Slavek Kwi, working under the name Artificial Memory Trace. In his talk, he linked the relatively anarchic space of experimental composition to his upbringing under the strict rules of communist Czechoslovakia; the distinctness of his experience evidenced by the passing comment that he never really got into trouble with the regime, and that the police only confiscated or destroyed his record collection a couple of times! Kwi’s audio brought a musical approach to field recording, utilising repetitive rhythmic material and sounds collected at the site blended with strobe lights and sculptural elements to make a surprisingly theatrical and energizing performance. The artist’s belief in the importance of perception and its role in art gave his work a strongly material quality that was playful and intense. Curator Philip Samartzis presented Crush Grind, a work using sound and video recordings from a 2010 Antarctic residency. The audio component, previously heard at Heide Museum of Modern Art, features the exceptionally high quality recordings for which Samartzis is known worked together in a fashion that privileges content over process. This time around, Samartzis has included a video componentwherein almost static views of the Australian Base interior (minus people) are featured, with the intent of capturing the visual reality and mundanity of the station, while the high-resolution audio speaks of the scale and intensity of the southern continent. The work offers an intriguing insight into life on base and, ignoring the video, an evocatively crisp and spatially dynamic soundscape. 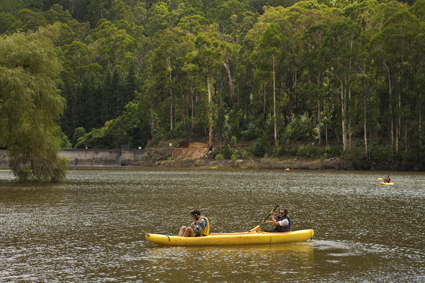 I hope Bogong AIR happens again and, if it does, you should try to be there. Site-specific sound is a fascinating area of practice that builds on sound’s unique acoustic phenomenology and aesthetics: it was presented here with integrity.